It is the hundreds that U.S. soldiers are then displayed against aggression towards Syria … in alliance with al Qaeda. The Second American Revolution is well and truly begun ! This is the message conveyed so long by Alex Jones and many investigations journalists outside the major information networks. » Infowars » great site Alex Jones reported information , especially then hier.L ‘ information was also circulated to European networks … and Russian . A military revolt against the Obama administration ‘s plan to launch a potentially disastrous attack against Syria is gathering pace , with two senior officers and members of scheduled services that express their vehement opposition to what the United States s ‘ entangled in the conflict. 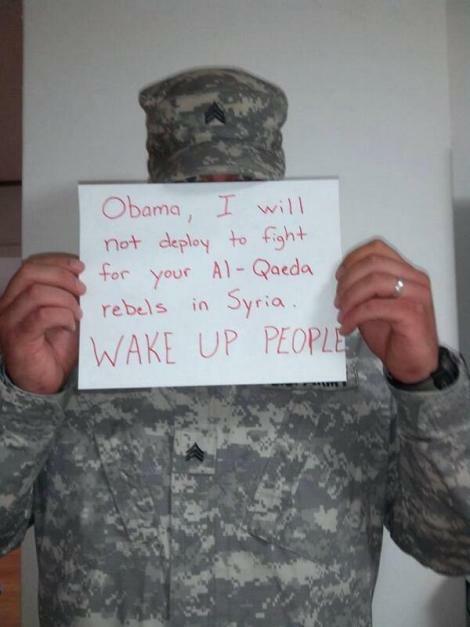 The reaction began to spread on social media yesterday with many military posting photos of themselves holding signs saying they would refuse to fight on the same side as Al- Qaeda in Syria. Others have posted their photos on Twitter with the hashtag # IdidntJoin . As the Obama administration prepares to present a draft resolution to the legislators is far from « limited » in scope and would actually grease the skids for a war of indefinite duration , John Kerry and other officials of the Department State reported that Obama will simply ignore the Congress , if the non- voting , and launch the assault anyway. This will do little to reassure a growing number of influential people in the U.S. military who become increasingly recalcitrant that the United States are being lured into a new war in the Middle East. Republican Congressman Justin Amash also said via Twitter : « I have heard many members of our armed forces. The message I ‘ve always heard is : Please vote no on military action against Syria. » The statement Amash was followed by a series of tweets military veterans who have also expressed their opposition to the attack. Paul Szoldra Business Insider also spoke of » sources are either veterans or currently on active duty in the military, » and asked them if they supported the military escalation in Syria. « Most responded with an emphatic , » write Szoldra . « Our involvement in Syria is so dangerous on many levels , and American veteran of the 21st century is more anxious to avoid more than anyone. It is beyond my comprehension that we are ignored, » added the former Corporal Jack Mandaville , a veteran of the Marine Corps infantry with three deployments in Iraq. There are not that military personnel who publicly exposes its concerns, Politico reports that leakage plan of attack that » come from the Pentagon bureaucracy less enthusiastic about an attack , say, the Department State , national Security Council and Obama himself , » are part of the unauthorized disclosures were » irritated » the White House. A web site for the U.S. Marine Corps has recently been hacked by a hacker attributed to the Syrian electronic army which has criticized U.S. President Barack Obama called the enlightened American soldiers as the » brothers of the Syrian army » . The message says that the Marines should be allied with the forces fighting for Syria and showed five people dressed in military outfit holding placards that said they would not fight for Al Qaeda. « Obama is a traitor who wants to put your life in danger to save the insurgents of Al- Qaeda , » according to the display on the site » Marines.com » . » Marines , please take a look at what your peers think of Obama’s alliance with Al- Qaeda against Syria. » The site » itself has not been compromised or » hacked » , according to his spokesman , Captain Eric Flanagan made ​​the statement on behalf of recruitment Command Marine Corps that operates the site. » He redirected for a limited number of hours during the night » and any confidential or personal information » was in danger , » he said . Flanagan said : » … at the time of the order can not confirm who was responsible for redirecting the site. » The post has been removed and the site is back to normal. The hack follows those on the New York Times, Huffington Post and Twitter accounts for the Financial Times and ITV by a group using the name of the Syrian Electronic Army – a network of hackers claiming to support the Syrian government and the President Bashar al- Assad.Les « pseudo rebels called » Free Syrian Army » ( al Qaeda false flag ) officers urged President Bashar al- Assad to defect Tuesday , seeking to earn points on the civil war in countries ( war they themselves caused ) during a lull created by Obama’s decision to consult the U.S. Congress on military strikes. key Obama advisers have launched a campaign to get the support of an attack on Syria, while Russia has rejected U.S. data on the use of chemical weapons by the Syrian government . the site is separated from the web address. Mil , which is the official website of the Marine Corps and information. Flanagan said the site mil. was not referred . Louis-Joseph Papineau addresses the people of Lower Canada (Quebec name at the time). He was the undisputed political leader of the Patriot Party. The Patriots were supported by more than English-speaking Canadians of Irish, Scottish and non-French Canadian origin at the time … contrary to what many current sovereignist ignore. The Patriots Rebellion of Lower Canada was to create a responsible goverment, eliminate corruption and create an independent nation of the British Empire. Great Cleaning corrupt politics that extends throughout North America will have a major impact on the parties, movements , groups and individuals working for the Liberation of Quebec. The time is right to go ahead and embark on this major change in North américaine.Il political will for sure the most profound change to intervernir in North America since 1776. This change will surpass in size, the Kennedy assassination , the attacks of September 11, 2001 ( which was an internal CIA plot ) and even the resignation of Richard Nixon.It is impossible to overlook this opportunity to participate in solid gold a great cleaning will improve the political life of the nations of North America . The Second American Revolution started recently, will coincide with the Second Patriot Rebellion Quebecers , for those who act for the Liberation of Quebec , will be in the prime of Words : True Patriots of Quebec . The history of mankind is full of such situations or nations have seized upon the opportunity to become free, at least change the rules of the game for an Empire collapsed. When the Roman Empire collapsed , Britain was one of the first nations to seize the opportunity and became itself an empire. Closer to home , there was the Empire of Austria – Hungary, which gave birth to many countries at the end of the First World War. Also think that the collapse of the Soviet Union and the Federal Republic of Yugoslavia ? The fate of the American Empire is part time and is in the same boat as the words inscribed on the pennies : « E pluribus unum » (from the union of several ) … and Canada as well as the Quebec is just a small piece of the empire , a little bit outside the borders but within the area of ​​influence . Long live the Second American Revolution ! Long live the Second Patriot Rebellion of Quebecers ! Long live the struggle for the liberation of the Sovereign Nations of the Earth!